Did you know that reading helps to reduce stress, improve memory, strengthen concentration and expand the vocabulary? These are only a few of the benefits that I’ve experienced as a reader. I’m so grateful that my mom instilled a love of reading in me early in life. I know not everyone is naturally as bookwormish as I am, but I do believe that every child should at least be encouraged to read. I fully intend to promote reading as much as I can throughout my own children’s lives. So here are five ways to encourage reading in children. It’s never too early to introduce a child to books. Newborns love to look at black and white pictures and hear the rhythmic sound of your voice. Older babies love to throw around those squishy plastic pages of baby books and occasionally stare at the pictures. Starting young will give your child the best chance at becoming a life long reader. Make it a part of your child’s daily routine to read. My son and I read before nap everyday which helps him to wind down. Pick whatever time of day works best for you and stick to it. And don’t stop once they can read themselves! Did you know that 100% of kindergardeners are interested in reading away from school, but only 54% of 4th graders? Fourth grade tends to be the age that parents stop reading to their children. I plan on reading aloud to my kids as long as they will let me!! Your children should see you reading frequently. Sit down with a book while they are playing or encourage them to sit down and read a book next to you. Our actions as parents, often speak louder than our words. Most libraries have free weekly story times for young children. Participate in these and other programs that they offer. Also, make a big deal out of your child getting their own library card when they are old enough and take them frequently. I always include books with my son’s birthday and Christmas gifts because it’s a great way to make reading exciting! Find out what your child is interested in and give them books on the topic. I love the motto, “want, need, wear, read,” for Christmas gifts. 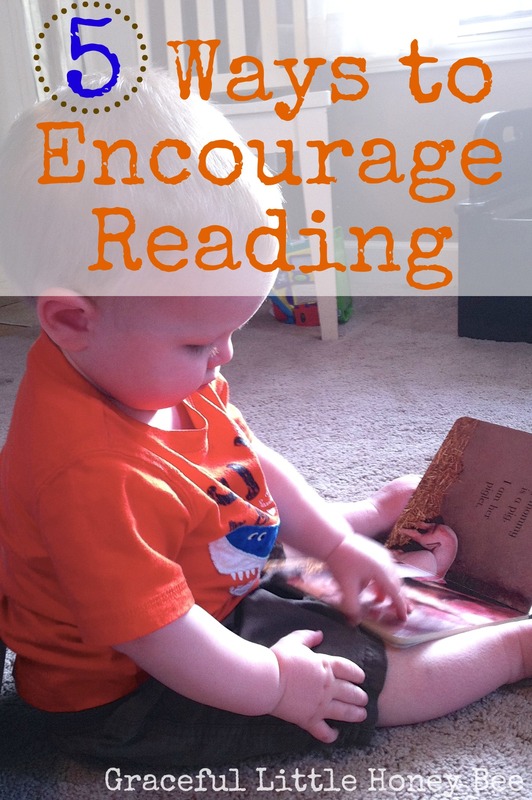 What other tips do you have to encourage reading in children? I read all of the time, and in fact I never leave home without a book. Hopefully my kids see that reading is such a great hobby. I've loved reading to my baby from before she was born! Now she's 13 months old and is a bit more interested in turning the pages, but I keep reading a loud anyway. Every so often something I say or how I say something catches her attention and I can get a full page in! I really wish more kids (and adults!) loved to read! We started the Want, Need, Wear, Read last Christmas and boy has it changed our home! Anyway, back to reading, we love it! These are great tips! I found this post by visiting the Frugal Friday Link Up Party. I love giving books as gifts to my nephews. They are the light of my life and they actually enjoy reading and having books read to them. Great post!